It could be the most heated debated rivalry of the century. 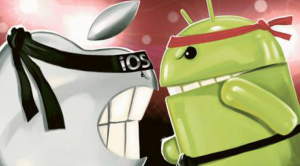 It's a question that has caused passionate arguments across the world: Which is better, iOS or Android? You could walk into a room full of people and ask each one which is their favorite smartphone operating system, and the odds are pretty good that most would have a preference. Some would even be able to explain why one is better, despite having never really used the other. i t's interesting that it appears that smartphone users are split right down the middle, when the Android operating system actually dominates the global market. As of this year, 78% of smart devices run the Android operating system, with iOS making up only 17%. With such a wide gap, one could make the argument that these two products aren't really competitors in the traditional sense at all. What these numbers more accurately show, is the market share of people who are more inclined to spend money on their brand new devices versus the people who are less inclined. iOS users account for 23% of online sales, while Android users account for only 5%. As you can see, these sets of numbers outlining market share and the amount of money being spent on them are pretty reversed. This shows to some degree that Android devices are viewed by many as the natural replacement to their previous products that do not run such software. Have you found that you use barely any of your smartphone's features? Would you agree that many use their smartphones as the new basic phone? We'd like to hear your thoughts in a comment below!